Born in Smithers, British Columbia, Predators defenseman Dan Hamhuis, has been playing hockey since he can, and sometimes cannot, remember. Even if his first years were not ideal for a young boy starting out, Hamhuis believes they were good for him. 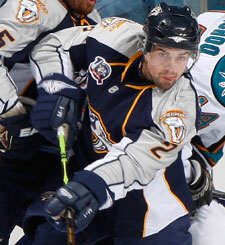 Coming from an athletic family, Hamhuis is the only one to make it to the professional ranks. The boys are not the only members of the Hamhuis household to lace up the skates, however. As he got older, he went on to play his last four years of minor hockey with the Smithers Storm. Smithers is a small town of just over 5,000 people that falls into the Omineca district of the British Columbia Amateur Hockey Association, more commonly known as BC Hockey. Founded in 1919, BC Hockey is a non-profit organization and member branch of Hockey Canada in charge of governing amateur hockey at all levels in British Columbia and Yukon Territory. Hamhuis got his first taste of success with the Storm. Little did he know at the time that he would be in the company of his Predators teammate, Shea Weber, and current Nashville prospect, Cody Franson. Weber also recalls the Storm’s trip to Sicamous. When Hamhuis was 15 years old, he left home to play junior hockey for the Prince George Cougars of the Western Hockey League. Moving to such a bigger city can be unnerving. Luckily, it wasn’t too long of a trip for his parents. It would be safe to say that Hamhuis enjoyed his days at Prince George. His years with the Cougars were filled with many great moments. But among all his memories on the ice, the one that sticks out above the rest came off it. It seems that hockey has worked out well for Hamhuis, too.